Ahhh, just the name itself calms my nerves. So what is Peace & Calming you ask? About six months ago, I was asking that very same question. In short, Peace & Calming is a Godsend for those suffering from stress, anxiety, depression and/or tension that want natural ways to relieve these symptoms. Anxiety disorders are the most common mental illness in the U.S., affecting 40 million adults in the United States age 18 and older (18.1% of U.S. population). Essential oils help to alleviate any sort of emotional issues one may be going through. They are unlike any anti-depressant today. EOs work by bringing refreshment and balance to the limbic center of the brain, which controls emotion, reasoning and smell. I was first introduced to the therapeutic qualities of essential oils through my midwife and doula. They both recommended P&C to me after the birth of my son to help relieve depression and anxiety. I wasn’t sure what it was at the time. In fact I had no idea it was something that needed to be ordered, that I couldn’t just walk into a grocery store and get it. I also had no idea how well it was going to work. I only wish I had ordered it sooner! Peace & Calming is an oil blend created by Young Living to help individuals deal with various problems related to the nervous system and emotional balance. This blend has historically been used to help reduce depression, anxiety, stress and tension. 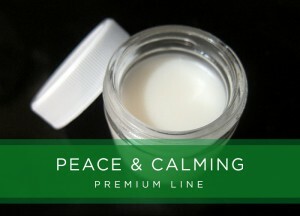 P&C may be useful at the end of a stressful day to calm nerves and emotions, promote relaxation or to relieve insomnia. By helping the body relax, more blood is able to circulate to the brain, allowing goals and dreams to be visualized more vividly and accurately. It has also been stated that this blend may help hyperactive children get off Ritalin and may also help children with hypertension. Peace & Calming can be diffused in the air or applied topically. Apply Peace & Calming topically under the nose, to the navel, on the back of the neck, wrists, back (diluted), and on the feet. It can also be worn as a perfume or cologne. When I first started using P&C, I would carry it with me and inhale it from the bottle during times of increased anxiety. I also created a new deodorant from it, making it a part of a new premium line I’m now offering on Etsy. Having it in the deodorant is great because it makes me feel like that stress reduction is “with me” all day long. It feels as though I’ve got a force field around me, helping protect me from anxiety! I also apply this to the bottoms of my feet (I apply it diluted) before bedtime. I get a much more restful night’s sleep after an application, with an occasional side serving of some wacky dreams! Avoid exposure to direct sunlight for 3 to 6 hours after use, as this blend may cause increased photosensitivity. Contains esters and aldehydes, which are sedating and calming to the nervous system. It is also a diuretic and a decongestant of the lymphatic system. Brings peace and happiness to the mind and body and joy to the heart, which feelings provide emotional support to help one overcome depression. May help balance the male-female energies so one can move closer towards being in spiritual atonement and be able to focus their thoughts, filtering out the ever-present garbage. It brings back feelings of self-love, confidence, joy and peace. This oil is sedating, calming and relaxing, allowing it to reduce anxiety. May help cleanse the liver and calm the lymphatic system. 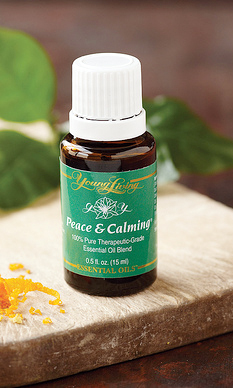 You can order Peace & Calming directly from Young Living. Anyone can order it, but you’ll need my sponsor/enroller ID in order to process your order. My ID is 1563299. If you want to take advantage of wholesale prices, you can become a distributor (no obligations to sell, it’s like a Costco membership) or if you’re local, I’m happy to place the order for you using my account and you can pick up from me. * This the posts in this blog were written to provide information to help educate readers in regards to the subject matter they contain. The author is not liable for the misconception or misuse of the information provided. It is not provided in order to diagnose, prescribe, or treat any disease, illness or injured condition of the body. The author shall have neither liability nor responsibility to any person or entity with respect to any loss, damage, or injury caused or alleged to be caused directly or indirectly by the information contained in any of the blog posts. The information presented herein is in no way intended as a substitute for medical counseling. Anyone suffering from any disease, illness, or injury should consult a qualified health care professional.